Altostratus translucidus over Hong Kong, China in May. Rain possible in thickened clouds. Classification is changed to nimbostratus if rain becomes persistent. Altostratus is a middle altitude cloud genus belonging to the stratiform physical category characterized by a generally uniform gray to bluish-gray sheet or layer. It is lighter in color than nimbostratus and darker than high cirrostratus. 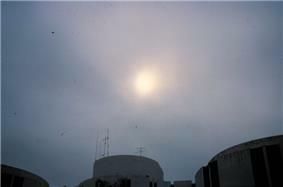 The sun can be seen through thin altostratus, but thicker layers can be quite opaque. Altostratus is formed by the lifting of a large mostly stable air mass that causes invisible water vapor to condense into cloud. It can produce light precipitation, often in the form of virga. 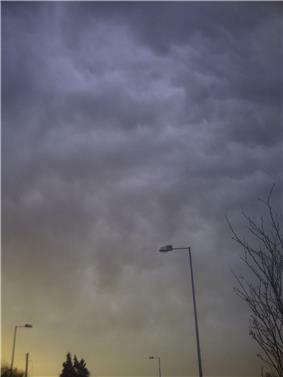 If the precipitation increases in persistence and intensity, the altostratus cloud may thicken into nimbostratus. Altostratus most often takes the form of a featureless sheet of cloud but can be wavy (undulatus) as a result of wind shear through the cloud. It can also be fragmented (fibratus) with clear sky visible, which often signals the approach of a weakened or upper level warm front. 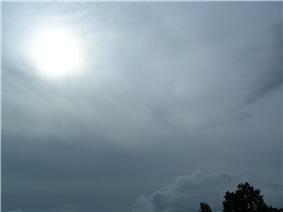 Altostratus may be composed of ice crystals. In some ice crystal altostratus, very thin, rapidly disappearing horizontal sheets of water droplets appear at random. The sizes of the ice crystals in the cloud tended to increase as altitude decreased. However, close to the bottom of the cloud, the particles decreased in size again. During the sampling of one cloud, the scientists noted a halo while flying near the top of the cloud, which indicated that the ice crystals were hexagonal near the top. However, farther down, the ice crystals became more conglomerated. Altostratus tends to form ahead of a warm or occluded front, the altostratus gradually thickening into rain bearing nimbostratus. However it can also occur together with cumulus congestus or cumulonimbus at a cold front. 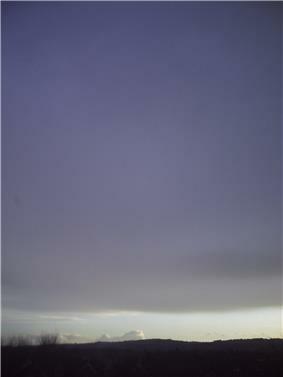 Species: Altostratus is not divided into species because it is always nebulous or featureless in structure. Opacity-based varieties: Altocumulus translucidus is relatively thin so that the sun or moon is always visible as if seen through frosted glass. It is strictly a middle cloud and is coded CM1 in the SYNOP report. The opacus variety is sufficiently thick to obscure the sun or moon and can extend vertically into the high étage. It is therefore sometimes classified as vertical or multi-level, but is still coded CM2 as a middle cloud. 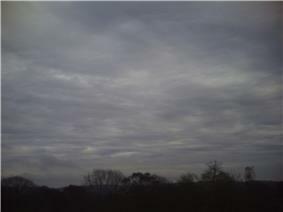 Pattern-based varieties: Radiatus, duplicatus, and undulatus are all occasionally associated with altostratus. Precipitation-based supplementary features: Altostratus opacus can be thick enough to produce both virga or praecipitatio features. Cloud-based supplementary feature: Mamma may be occasionally seen with altostratus, especially if it is associated with or changing to or from altocumulus. Accessory cloud: Pannus forming in precipitation is sometimes seen with altostratus and is coded CL7. Genitus mother clouds: Altostratus altocumulogenitus forms due to the fusing of altocumulus elements. Altostratus cumulonimbogenitus results from the spreading of the middle part of a cumulonimbus cloud. Mutatus mother clouds: Cirrostratus can thicken into altostratus cirrostratomutatus, usually ahead of an approaching disturbance. Nimbostratus associated with an organized weather system may lift and change into to altostratus nimbostratomutatus, especially if the disturbance is weakening or moving out of a particular area. "Velum" This is considered a type of cumulonimbus cloud so it is not listed. ^ a b "The cloud classification system - Altostratus". Archived from the original on 26 April 2009. Retrieved 26 May 2009. ^ World Meteorological Organization, ed. (1975). Altostratus, International Cloud Atlas (PDF) I. pp. 35–37. ^ World Meteorological Organization, ed. (1975). Species, International Cloud Atlas (PDF). pp. 18–20. Retrieved 26 August 2014. ^ World Meteorological Organization, ed. (1975). Varieties, International Cloud Atlas (PDF). pp. 20–22. Retrieved 26 August 2014. Field, Paul R. (June 1998). "Aircraft Observations of Ice Crystal Evolution in an Altostratus Cloud". Journal of Applied Meteorology (American Meteorological Society) 56: 1925 1941. "Altostratus Cloud (in Atmospheric Chemistry)". IUPAC Compendium of Chemical Terminology (PDF) (2 ed.). Platt, C. M. R. (April 1977). "Lidar Observation of a Mixed-Phase Altostratus Cloud". Journal of Applied Meteorology (American Meteorological Society) 16 (4): 339 345.